Robin Williams | Life is Good… But the Best is Yet to Come! Robin Williams, beloved comedian and accomplished actor, died yesterday… A sad day. On my Facebook feed, every single post last night had something to do with the passing of this great star – people of every generation posted stories and memories of his movies that affected their lives… Isn’t that amazing? 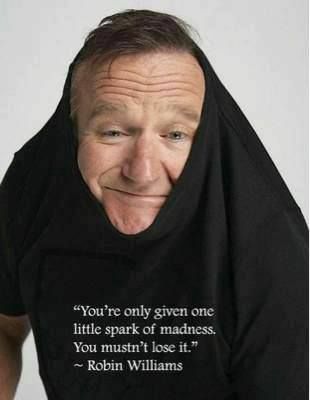 Whether it was remembering “Aladdin” and “Mrs Doubtfire” or “Mork and Mindy” or “Dead Poet’s Society…” We all have memories of this actor and the ways he made us laugh or cry. Dead Poet’s Society was my favorite movie for a very long time… I cried for days after the first time I saw it. (I still do.) I think this was one of those moments that made me think I could be someone in the world… What was the quote? “No matter what people tell you, words and ideas can change the world.” His role as Prof. Keating reminded me that one person can make a difference in other people’s lives… Especially with the fragile lives of kids. I loved that he taught them to go ahead and be themselves, even if it’s a little different – in fact, embrace what’s different and live! Ahhh… I could start crying again, now. I have funny memories of Mork and Mindy – as a little kid, my parents and I used to walk around the house, saying, “Na-nu, Na-nu” to each other. Aladdin brings back memories of my youngest sister’s toddler days… We would watch that movie over and over… and over… and over again. For awhile, I knew every word to every song. And it was always fun to sing and play – it really never got old. Patch Adams made me smile – and cry. The message of compassion and love for all people always struck and chord for me. What Dreams May Come was different. And beautiful. And Awakenings… Won my heart. Every time it’s on TV, I stop to watch. A beautiful story of the fight for real life… over just sustaining a heart beat. Once again, the compassion and love for people came through in determination, humor, play, quiet sincerity, and grace. So many movies in this talented life… So sad to see it end so soon. And so marvelous that he was able to affect so many lives through his art… Amazing. Life is short, friends. It’s time to Carpe Diem! Live life boldly. Work hard. Play lots. Value and nurture those friendships. Love your family. DO life. We each have a role to play – lives to share – memories to make. If nothing else, let Robin Williams remind us of that… And to live with laughter. What better way to honor his memory? !